Cultures all over the world have occasions to honor and remember their ancestors. Hindus observe Pitru Paksha; in Mexico they celebrate The Day of the Dead, and the English have All Saints Day. In Japan, this commemoration of ancestors is called Bon Odori, or simply Obon. This 500-year-old Buddhist-Confucian custom continues today in Japan, where families pilgrimage to the burial sites of their relatives to clean the graves, make offerings, and dance the Bon Odori. In 2011, Hudson Valley resident Youko Yamamoto, former owner of the Japanese noodle shop Gomen Kudasai, decided to launch a Bon Odori dance festival locally. Catalyzed by the Fukushima Daiichi Nuclear Power Plant meltdown, Yamamoto decided to expand the scope of the event to make it the Bon Odori Festival for Peace. The celebration has become a vehicle for raising awareness about the dangers of radiation, rallying for a nuclear-free future, and commemorating the deaths of those who were killed in Nagasaki and Hiroshima, as well as all other ancestors. 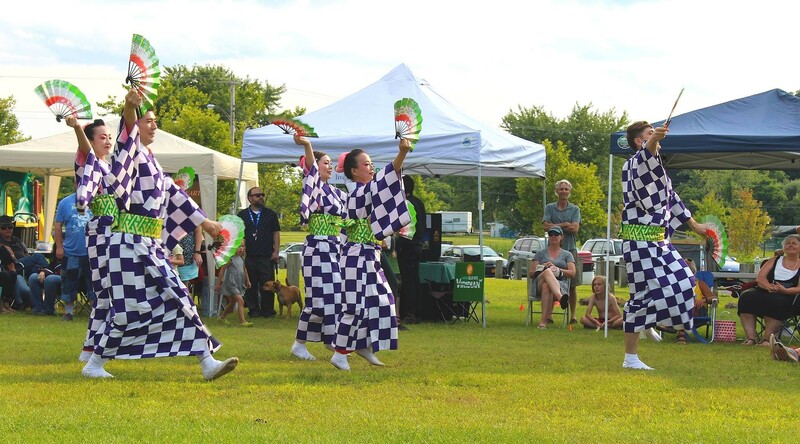 This year, the 8th Annual Bon-Odori Dance Festival For Peace will be celebrated on August 4 at Kingston Point Beach, from 12-8pm. Co-sponsored by RUPCO, this is a full-day, family friendly affair that will include performances by the Vanaver Caravan Dance Company, food, live music, and local vendors. 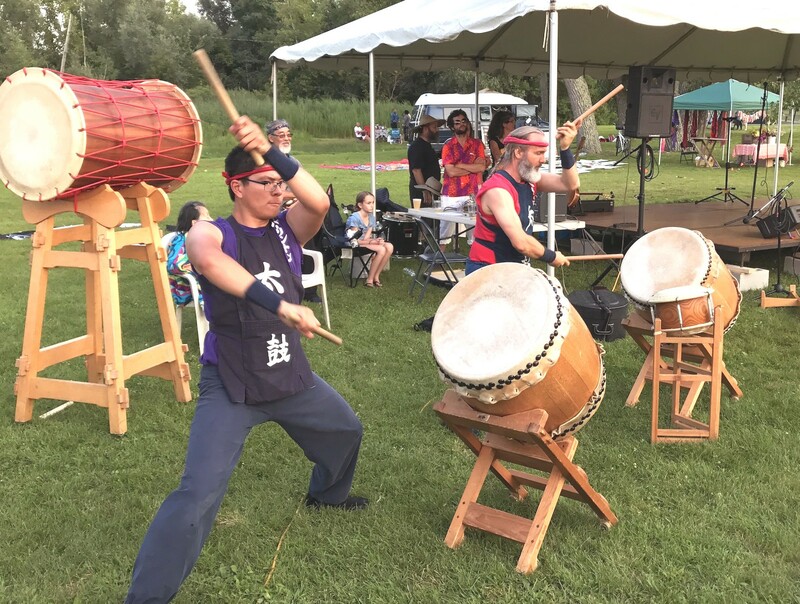 At 6:30pm, the Minbuza Japanese Folk Dance Company from NYC and Stuart Paton, Taiko drummer from Burlington Taiko, will lead the traditional Bon Odori dance. After everyone is joined together through dancing, a Buddhist monk will lead the community in prayer for the victims of the bombing of Hiroshima and Nagasaki. The nonprofit Shumei will be running a booth of organic Japanese food products like oil and rice, as well as a tea ceremony booth, where people can drink tea and learn about this ancient Japanese ritual. Yamamoto herself will revive the Gomen Kudasai brand with a food booth serving up vegan rice bowls and okonomiyaki. "Okonomiyaki is a huge hit in Manhattan right now," Yamamoto says. "People say it's pizza in Japanese style, but it not really. But it does sort of look like fake pizza. Yamamoto makes the dish using organic wheat flour, cabbage, pickled ginger, aioli, and tonkatsu sauce and cooks it on a griddle. Yamamoto will also set up a booth called "Japanstock" with tableware, ceramics, fabric, and records so people can get a sense of the creative aesthetic and culture of Japan. Frank Water of My Kingston Kids will run a kids' corner, where families can lounge comfortably, learn yoyo, and make origami cranes. "When I started this, I decided to focus not just on my personal ancestors, but to welcome all spirits who want to be with us and teach us, focusing especially on victims of radiation disasters," Yamamoto explains. "These were people who just wanted to live a normal life, and couldn't because of a human-caused disaster. So we thank them and honor their lives and spirits, and get energy from that to keep working toward a nuclear-free future." This year, Yamamoto has called in experts on various waste issues to lead a community round table on the theme of waste. "My intention for this round table is to raise awareness of nuclear waste. But since the waste is such a big, big issue, we can talk about any kind of waste issues such as food, plastics, power," Yamamoto says. Community members are invited to bring their comments, questions, and ideas to the discussion, which will be held under the pavilion. "We have to start thinking and talking about it instead of just looking at quick information on Instagram and Facebook. The festival is not just for fun—the main thing is to raise awareness of danger of radiation so we can move toward banning nuclear weapons and power plants." For the 8th Annual Bon Odori Festival for World Peace, Yamamoto has also organized a historic first encounter between a survivor of Hiroshima and an American dermatologist who tended victims. Tomiko Morimoto West, who is 86, attends Bon Odori every year to speak about her experience as a bombing survivor. Dr. Marie Johnson, who is in her early 90s, was among the first crew of doctors sent with the Atomic Bomb Casualty Commission to help victims and research the effect of radiation on human skin. The two women will have a special table set for them in the pavillion, and people will be welcome to gather and watch and listen to their interaction.Yamamoto has hired a documentary film maker to capture the meeting. ""These two ladies are meeting for the first time at this festival, 73 years after the bombing," Yamamoto says. "We really have to listen to what they have to say, even if it is kind of heavy." At the same time as the women will meet (around 1:30pm), Vanaver Caravan will do a world dance performance on main stage featuring a young dancer from India. This is not coincidental. Yamamoto is pleased that people from around the world will dance together as we also remember and honor history—the true essence of Bon Odori.